The fall television premiere season is off to a great start! This week on FOX the anxiously awaited new season of “Gotham” — the prequel series that takes a definitive look at the stomping grounds of the Dark Knight Detective, Batman — took off in a very big way, with some shockers and big surprises. After a heavily criticized first season, that often had viewers scratching their head about exactly what show they were tuning into, Gotham’s second season is delivering on its dictum to reveal the “Rise of the Villains”. After heavily inspiring a gangland war among the major players in the underworld governing the streets of Gotham, Oswald Cobblepot (Robin Lord Taylor) more theatrically known as “The Penguin” has ascended to the upper echelon as a kingpin in control of a thriving empire. Seeking to reclaim his position on the police force, Detective James Gordon (Ben McKenzie) literally makes a deal with the devil and has unwittingly set off a chain reaction that may lead to his own downfall! Among some of the more colorful characters that appeared in the premiere is of course one particular Arkham Asylum inmate named “Jerome” that has a striking resemblance to a certain Clown Prince of Crime. He’s setting his sites on fellow nutcase Barbara Kean (Erin Richards) who admittedly murdered her parents after an episode facing the sociopath named “Ogre”. Rumor is that Barbara will emerge as one of Arkham’s bigger players this season, but that remains to be seen. Concerned about Gordon’s current trajectory Dr. Leslie Thompkins (Morena Baccarin) is keeping a very close eye on Jim, who is making plays and shaking hands with some shady characters en route to reclaiming his role in the GCPD. Even Harvey Bullock (Donal Logue) is telling Gordon to give up trying to save the world. Gotham belongs to the “villains” and one in particular is taking shape right under everyone’s nose — exactly what’s going on with the CSI examiner Edward Nygma (Cory Michael Smith)? Meanwhile a very determined young Bruce Wayne (David Mazouz) is desperate to uncover the secrets underneath Wayne Manor. What exactly was his father Thomas Wayne up to that lead to him hiding a passage behind the fire place; what’s behind the big, metal door and was Wayne Industries dealing in dubious exchanges for its own personal gains, and adding to the corruption that has taken root in Gotham’s society? This season on the series Gotham will be playing a very dangerous role as the city’s history is further explored. That of course has lead fans to speculate that along with the Batman’s infamous rogues gallery ascending towards their destinies, in the sinister shadows lurks one of the more complicated threats to Gotham: The Court of Owls. Executive Producer and “Gotham” showrunner Bruno Heller has more openly admitted that he and his team would be most interested in diving into the mythology. Introduced into “The New 52” Batman’s mythology, the Court of Owls revealed a darker nature to Gotham’s high society and a new kind of villainy indeed. “I don’t want to spoil part of the story,” Heller has been reported as telling ComicBook.com. “The Court of Owls is very much deep DC mythology.” Though the Court has only recently risen in prominence in the current Batman mythos, since elaborated upon in major arcs in the comics by Batman leading scribe Scott Snyder and artist Greg Capullo the hope is that the introduction of the Court will help to differentiate “Gotham” from film director Chris Nolan’s Dark Knight Trilogy. Whatever course “Gotham” is on, this season’s approach of two separate serialized arcs is certainly going to give the writer’s room to grow some of the fans more favorite storylines. 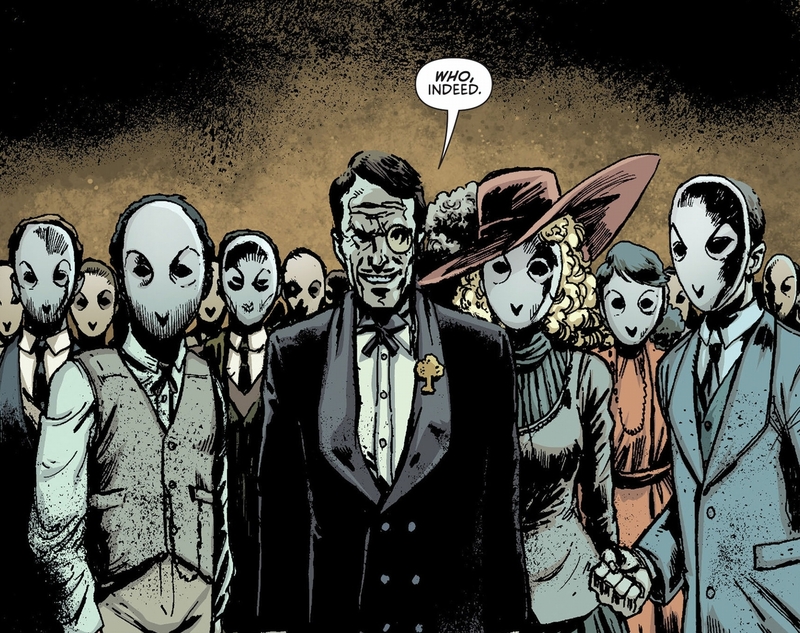 With “Rise of the Villains” being the focus of the first arc, the Court of Owls would certainly play into the duplicitously diabolical nature of the city’s governing high society. But Heller admits that they may “explore that world down the line.” Hoping that the show proves in longevity and some elements may need development. “The long arc of the show is Bruce Wayne’s journey of discovery,” Heller told ComicBook.com “down into the depths of the physical and meta-physical world of Gotham. The Court of Owls is a brilliant conceit that will absolutely be part of our storytelling.” We’ll just have to wait and see which villains will ascend to the forefront of “Gotham”. Tune-in every Monday night to FOX as the revelations take shape on Bruce’s journey deeper into the cave.